Today’s CCF commences what we expect to be a major task to correct Constitutional myths and dubious facts. Here’s one we heard about a month ago on ABC TV. On the Drum a high profile lawyer* stated “A lot of people don’t know this actually, Australia borrowed, pretty much copied the US Constitution”. As we are made aware of statements such as this, which are constitutionally factually incorrect we will attempt to draw them to your attention rather than let them realise into common misunderstandings. We hope you’ll help us with this project. We expect over the next few months with your support we will build a library of misunderstood accounts about the Australian Constitution. As always, we will attempt to bring this information to you in an impartial, nonpartisan and factual way. You may have heard this before. Here at CEFA we hear this statement every now and then. But if this was true, wouldn’t we would have a President? And a Congress rather than a Parliament. The forebears of our Constitution did look all around the world at many different Systems of Government and Constitutions, and the US Constitution was one of them. In fact some parts of our Constitution are similar, including our elected Senate. By the 1850’s discussions about federating the Australian Colonies were starting to become more common. One of the largest figures of nineteenth century Australian politics, Henry Parkes, was heavily involved in this debate. After a visit to the US and England in 1881-82 Parkes arrived back in Australia with a new goal to establish a comprehensive System of Local Government and make a vigorous attempt to Federate the Colonies. 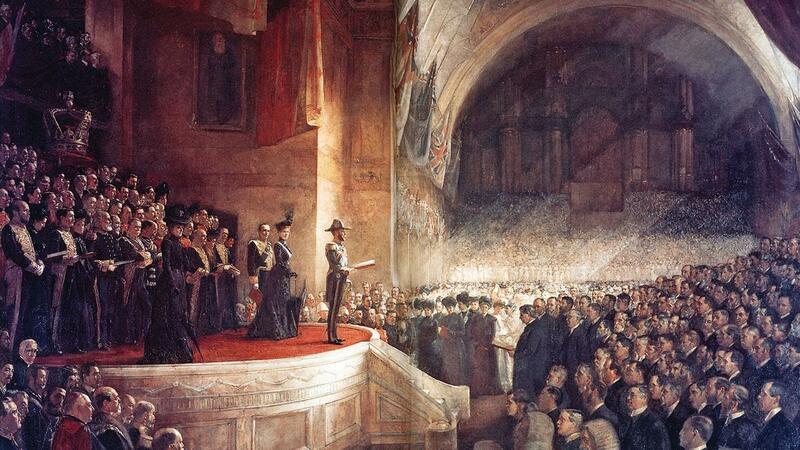 In 1889 he gave his famous Tenterfield speech in which he asked “whether the time has not now arisen for the creation on this Australian continent of an Australian government and an Australian Parliament”. In this speech he mentioned the US Congress, the Canadian Parliament and even the House of Commons examples of something Australians should be striving for. The drafting of our Constitution began around this time, through a series of Constitutional Conventions (meetings) held in the Colonies and attended by delegates from the Colonies. The first draft of the Constitution that was circulated prior to the 1891 Constitutional Convention in Sydney was primarily written by Tasmanian barrister and politician Andrew Inglis Clark. Clark, somewhat a radical of his era, had spent time in the US and was impressed with their democratic and republican ideals and their Constitution. You can read the first draft of the Constitution online here at the National Archives of Australia. Henry Parkes had some reservations about this draft of the Constitution, and after he received it suggested that “the structure should be evolved bit by bit”. The delegates at this first convention were appointed by the Colonial Parliaments. But the public sentiment about the first draft was not very positive and as such delegates at the later Conventions were popularly elected. These delegates worked together to form the Constitution we have today by examining each Section adding, altering and abandoning parts as they went along. These forebears examined the System of Government in Canada, federated under the Crown and with two Houses of Parliament that was important to the Australian delegates. However, the upper House in Canada was appointed rather than elected and this was not seen as ideal. The United States system was also examined, but possible gridlock between the Houses in the US Congress were resolved in the Australian system by the provision of double dissolutions. The delegates also looked closely at a number of other countries including the United Kingdom and Constitutions from Switzerland, Germany and South Africa. The founders of our Constitution carefully and creatively mixed elements of existing Constitutions with some new and innovative features of our own. So while parts of our Constitution may seem similar to Constitutions of other Countries, the final Australian Constitution is a unique and original System of Government that we can be proud of. Our Parliamentary model with two democratically elected houses, the provision for referendums to amend the Constitution and the ability of disagreement between the Houses to be resolved makes our System of Government one of the most stable democracies in the world. Have you heard a Constitutional myth? Let us know in the comments below. If you see anything in an article that you think is not quite right, please let us know so we can amend it. Last week we wrote that in 1974 “All six Bills passed, in what is the only time a joint sitting of the Houses has occurred in the history of our Federation.” We were advised by a CEFA reader that there was a commemorative joint sitting in Melbourne for the centenary of Federation in 2001. We have now amended the article to reflect this. Those of you following the conversation will be seeing these important contributions from our audience. If you want to join the Facebook conversation click here. * Education is all about empowering people with information. We abhor the naming and shaming of people and as such will not be naming the person who made this public statement.